Critical Reflection and Learning – Russell Consulting, Inc.
How relevant is your high school or college education to the work you do? For many of us, there is often a large gap separating what we learned in school from what we must learn to stay in business. Its not that your formal education doesn’t add value, its just that, by itself, your formal education cant sustain your long-term success in work and in life. Your education and learning must be a continuous process if you are to keep your life (and your business) moving ahead. In recent years the term life-long learning has been used to describe the importance of investing in your own self-development and growth. But what does life-long learning really mean and how might you translate this abstract idea into your life as a business owner or employee? Life-long learning is an idea that asserts that your long-term effectiveness for yourself and for your business – involves a life-long pursuit of exploring, discovering, taking risks, and asking questions. It acknowledges that long-term effectiveness depends upon taking in new information, insights, and knowledge and then integrating this information, insight, and knowledge into your thinking and, eventually, into your daily work. The late W. Edwards Deming the man most responsible for getting U.S. companies to focus on continuous quality improvement argued that learning was the foundation of improvement in business and in life. To push this idea of continuous learning, he promoted the PDCA cycle as the key process for driving learning in an organization. This cycle also just happens to be the same process that drives learning within you, whether you are the owner of the company or one of its employees. Lets look at each component of this learning cycle and consider how you might use the model to develop yourself professionally in some capacity to both better serve the company and achieve your long-term career goals. Establish a Self-Development Plan. 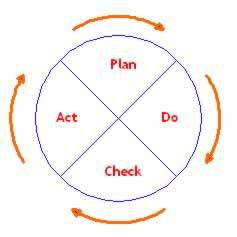 The P in PDCA, stands for plan. In the context of employee development, establishing a plan means your being clear about your long-term career objectives. This involves you reflecting upon where you want to go in life, what your long-term aspirations and goals are, and how your current position fits into these aspirations. Creating a self-development plan, then, first involves defining your personal vision and the specific near-term goals that will enable you to achieve that vision. Even if you don’t believe that your current job or line of business will enable you to achieve your personal vision, having this vision is the first step in your professional development and growth. With this personal vision in mind, you then create a set of shorter-term goals that strive to connect your daily work with your vision and which should be attainable in your current job with the company. For each goal, you should identify the specific actions that you’ll take and the actions that the company will also take (even if you own the company) to support you along the way. The plan part of the PDCA cycle requires you to have a clear idea of where you want to go in life, the goals you will need to achieve if you are to realize that vision, and the actions that both you and the company will take for you to achieve these goals. Implement the Plan. The D part of the cycle represents the do phase of the learning process. In this phase, you and the company are actively implementing the agreed-upon ideas and actions. Where your plan identified specific goals and possible actions to achieve these goals, doing means taking action, testing the possibilities, and trying out your theories. The company should support you during this phase by providing training, resources, equipment, time for learning, time off the clock if necessary, and financial support to enable you to work your plan. Evaluate Results. At some point, after you’ve had an opportunity to try out your ideas, read a book, talk with customers, observe other workers, or whatever else was part of your plan, you will need to assess whether you’re getting the results you and the company had hoped for. This is called the check or evaluation phase of the learning cycle. Its the place where you take time out to look at the data, study the results, and then make an assessment about whether what you had originally hoped to accomplish was actually achieved. Gathering objective data from customers, co-workers, the boss, your board of directors, the actual outputs from your work, among other sources, are all essential here. Critical Reflection. The next phase of the self-development process is perhaps the most important. This phase, labeled A for act or adjust is the point where, based upon the findings from the check, you (as a life-long learner) reflect upon what has worked and not worked, gaze into the world around you, and then adjust your thinking and actions for the future. This phase is the first one where self-development learning actually occurs. Developing a plan, implementing that plan, and evaluating its effectiveness require little critical reflection. Looking deep into the results of your performance and asking yourself whether you need a new set of skills to achieve your goal forces you to question your understanding of the world, the company, its customers, and even your own thinking. The further off the mark your results are from what you expected, the more you need to look deep into the environment, the company’s practices and tools, and your way of thinking and acting. Your cycle of learning and self-development completes itself when, based upon the insights gained from this phase of critical reflection, you develop a new and improved self-development plan for your work and life. And the cycle begins again. The late Nelson Mandela, former president of South Africa, once observed that greatness lies not in never falling, but in rising every time you fall. Life-long learning and the self-development process result from setting out a personal plan, implementing and evaluating that plan, and then making adjustments to that plan. This learning cycle works for individuals and organizations because it enables us to not only rise after falling, but to learn from that falling and then to apply that learning to the next phase of our personal and professional development. Through this cycle, we become wiser and stronger – and bring greater value to our company and to our own life. For a PDF version of this whitepaper, click here: RCI Whitepaper – Critical Reflection is at the Core of Learning.